Over the weekend I had the chance to fly United’s recently renovated 777-200 featuring new Polaris business class seats. This is the same aircraft that featured United’s new premium economy seating. I used a Global Premier Upgrade to confirm an upgrade to business at time of booking…a rarity lately on United. 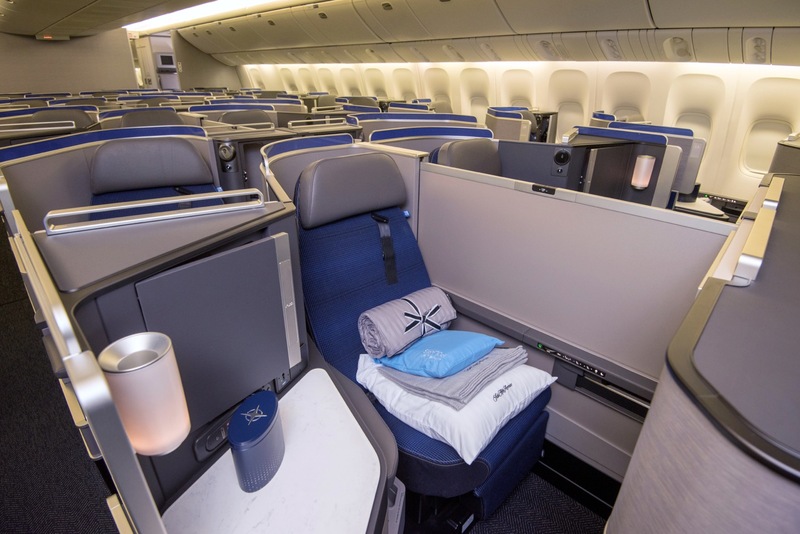 The newly retrofitted 777-200 features 50 seats in Polaris Business Class. This leaves the cabin with two more premium seats than the combined first class (8) and business class (40) in the old cabin. It also matches the cabin with the ex-Continental 777-200s which feature 50 seats in a 2-2-2 configuration. While maintaining the same cabin density, every seat offers direct aisle access. Furthermore, the seats feel incredibly more private than the old eight across seating on the same aircraft. All in all, United has done a fabulous job in offering a great new product while economizing space and maximizing cabin density. My flight encountered a 3.5 hour mechanical delay. I ate dinner in the Polaris Lounge and had planned to just sleep, but by the time the flight finally took off I was hungry again. Dinner began with mixed nuts followed by a tuna appetizer and salad. I chose pasta for the main course, a cheese ravioli with mushrooms that was very tasty. I skipped cheese and dessert was able to quickly fall asleep. I’ll post a full review of the flight in the days ahead, but do want to commend United for accelerating the rollout of the 777-200 and 767-300 retrofits. I still slept fine in the old seats and never really disliked them, but these new seats are so much better and make United far more competitive on this route against Lufthansa. In fact, I would always take United over Lufthansa if I knew I would have a new Polaris seat. …but these really aren’t any better than a standard reverse herringbone seat, either version, right? They are more private than reverse herringbone, especially the odd numbered windows. This is a fantastic seat if you’re not too broad across the shoulders. Personally I prefer this seat to any reverse herringbone, as I found it hard to find a comfortable reclining position with the tray table out for the latter. What happened to the nicely designed bulkheads as exists on the 767 and 77Ws? I noticed that too. I miss them. No mood lighting either like the 773. Scott Kirby at work! Those nice touches don’t immediately translate to marginal revenue, ergo they aren’t added. You hit the nail on the head — great seat and better than LH, if you knew you “would have a new Polaris seat”. Which you don’t know typically until a few days before. And with the 772, there is a high risk you won’t get the new seat because only 6 of 51 have been converted. I’d personally take the old seat over LH, but I understand why many prefer LH over eight across. Fair point. I like the Polaris EWR lounge so much, I would happily take the old United seat for an overnight to Europe, especially on a 767 where it wasn’t 8 across. I’m looking forward to more revamped UA planes, and racking up more lifetime miles to hopefully get Million Miler before I retire. Not sure UA can be competitive with Lufthansa or vice versa since they share revenue on the route! But it’s a nice product. You’re right – I’m only talking about onboard product. Should be identical to the 777-300 right? Does the 200 have the huge lav behind L2? 777-300 has 60 seats in Polaris business class. I did not see big lavatory. Sorry, meant to say that the experience should be the same, it is after all the same seat in shorter plane. Did they also update the economy cabins on these reconfigured 777-200s from the 3-3-3 to the 3-4-3 configuration? I completely agree with Matthew. It’s not popular to give credit to United, but the new Polaris seat, meal and service are very good and int’lly competitive. I’ve recently flown business class on Cathay and Air Canada, and United Polaris was at least on par with Cathay and vastly better than Air Canada (particularly the food/meal service). I had expected Air Canada to be a special treat, but United’s flight (in this case to Frankfurt) was so much better. It’ll be very nice when all United aircraft have been retrofitted with the new Polaris seat. I flew on two different Air Canada aircraft: their 787 (Toronto to SFO) and 777-300 (Rome to Toronto). The seats were fine and close to United’s. It was the food and service. On both flights the service was just okay and the meals were pretty average. The United crew from SFO – Frankfurt was better and their move to improve their meal service is noticeable. Can you please give me the link to get a daily or weekly email with all the articles? Sorry, I don’t have a link. If you delete the cookies from my site, it should pop up as you scroll down the page of any article. What was your route? Also did you find the new seat configuration under the details of the flight at booking or it was a surprise at check in? Matthew – WOW your photos are outstanding in this preview. They truly do look like stock photos (of course, I know they aren’t). Keep it up and glad you enjoyed your flight! Hi Alvin, the first two photos were taken at a press event I was at in SFO with the retrofitted 772 earlier this year. The others were from my flight. I’ve flown the 77W Polaris six times, plus a 7th on a very pleasant last minute swap in on HNL-SFO. It’s vastjy superior to LH and I found it better than ANA’s J on the 789 (that’s everything apart from the flight attendant service). The great thing is that they’ve maintained the density and hence seat count so there is a fair chance of getting an upgrade (as I got on SFO-HKG and back). The problem is once you’ve flown Polaris going back to the old plane is such a let down. UA is up to 3 mod lines for the 772 and I’d expect them to go up to 4 and even 5 once all the summer seasonal flying ends and the 781’s start international service. That should mean all the old 2-4-2 international planes are gone within a year, perhaps sooner. I’m hopeful they’ll be up to 11 Polaris 772’s by Christmas and that my SFO-LHR 772 will get Polaris. These seats are like a hybrid between staggered seats and regular herringbone seats. Still a bring improvement over their old seats, however. I find the best part of this configuration is that you don’t have to see your neighbors IFE screen (flashing explosions of whatever slightly aged blockbusters people are watching). In the 787 herringbone, from some seats you see at least six screens at a time. In the new Polaris, just see my own (unless I sit up really tall, then can see one other).